Imposter syndrome. It’s something the majority of us have experienced and as a mum it has a tendency to creep in everywhere… Whether it’s questioning your ability to look after a small human, cutting through the early days of brain fog to offer up anything more than nappy chat or returning to work and trying to remember exactly what your qualifications are again, it’s a constant presence. Rather than focussing on what motherhood takes from us (time, energy, identity, sleep, confidence to name a few), we need to recognise just how many skills being a mum has given us. 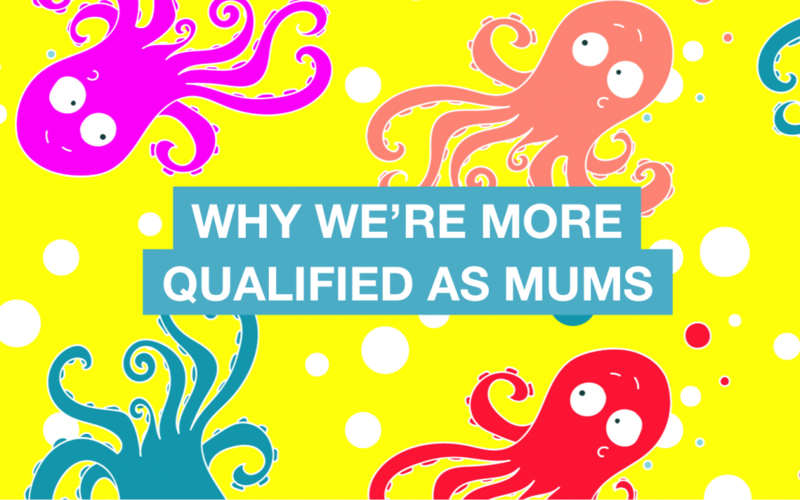 So if you’re looking to return to work or change career, before you dust off your LinkedIn profile and try to find ways of hiding your mat leave – or worse, justifying it – take a look at the qualifications you have gained since becoming a mum…. There’s nothing like the precious lack of time to motivate you to get your head down and blitz through a mountain of life admin before racing to attend your woken-up baby or nursery pick-up. As the saying goes, if you want a job done, give it to a busy person. If you want a job doing well, give it to a mum! What don’t we juggle as a mum? Whether it’s eating one handed, while feeding your baby or cooking a meal while rocking your baby to sleep or playing peek-a-boo on repeat, the luxury of being able to focus on one thing at a time is a thing of the past. Unlucky for us, but great for businesses! Mums have patience in abundance and an unnerving ability to stay positive even in the most challenging of situations. Whether it’s waiting for the seemingly endless sleepless nights to ease up or encouraging your little ones to explore when that inevitably means weetabix in every orifice and playdough stuck to every surface, we’re still standing at the end of the day (just). No team member is more difficult to manage than a child who has thrown him or herself on the floor like chewing gum and is refusing to shift. Mums are born leaders and negotiators and know how to motivate their team, play to people’s strengths and negotiate conflict to get the best out of everyone. Okay, sometimes small food bribes are involved, but that has the power to motivate at any age! It needs no explanation, but just getting out of the door every morning is a masterclass in time and project management; get dressed, get baby dressed, make breakfast, clear up breakfast (sometimes off the walls), pack day bag, negotiate getting shoes/jumpers/coats/suncream on, leave house. Return 5 mins later because nappy needs changing/child desperately needs the loo. In abundance – even though rarely is anyone listening to us. This is perhaps the most important skill you hone as a mum. And it starts as soon as they’re born, listening to the change in their cries to try to make sense of what lies beneath it. As they get older, we listen and learn what is behind their tantrums (most of the time. Sometimes it is just because they wanted the blue plate) and their tears. This makes for a much more rounded person in the workplace who can see beyond the surface and work out what is really going on. This guide was brought to you by our friends at at Digital Mums, who provide vocational training programmes designed to get mums job-ready in social media skills so you can find flexible work that syncs with family life. They’ve recently added a new 12 week course to their training academy, the Digital Retox, which aims to empower women with the digital skills and confidence needed in today’s 21st Century workplace. For a special Mush discount on Digital Mums’ September Digital Retox course, just visit here.